Synopsis: you would like to love me, But you do not really know me with these words, Queen Edith begins to speak to us, As if she were still able to address us, Though she lived over a thousand years ago. 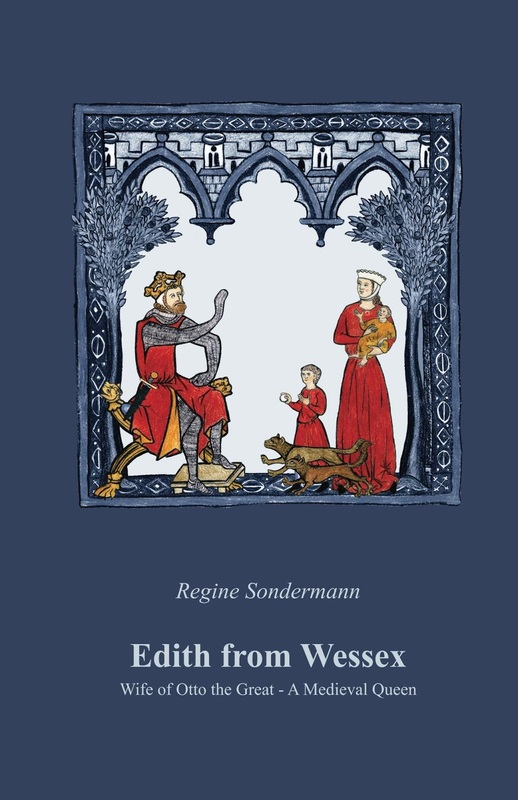 Magdeburg author Regine Sondermann draws the reader close to this woman from the early middle ages, about whom little was known until now, She was young and came from England. She died at the age of 36, And she was laid to rest in the Magdeburg, Cathedral. The author sifted though documents and history books to discover small shards of Edith's short life, like a ceramic bowl destroyed long ago. She has pieced them together in this story of a woman and her family, which takes the reader to an unfamiliar land that seems so close but is infinitely far away. The author contacted me though my blog to ask me to read and review her book. First of all l would like to say a big thank you to Regine Sondermann and giving me a chance to read it. I was sent this book in exchange for a honest review. I am glad this book is on my bookshelf. I would tell people that you should step outside your comfort zone with books because it is good to add more authors and genres to your reading portfolio even if you do not read books like this. I normally do not read books of this genre but l stepped outside my comfort zone with authors and genres. I am so glad l did because l have read so many great books. I highly recommend this book. The author is really nice. the author kindly signed my book the author wrote dedicated to Donna Chadwick may reading be pleasure. this book comes it two languages. Review: This book was really easy to get in to. I was hooked on this book after reading the first few pages. I can not put in to words how great this book is l would tell people to read it for themselves to know how great it really is. I love reading about history thanks to this book. I really enjoyed reading this book and story. This book has nearly 200 pages it it. This book is really great. I could happily read this story again. I would love to read more from this author. I would love to read more of this story. I was sad to read about Henry passing away. It was sad to read that Edith's mother and father passed away. I liked reading about Edith and Otto's children. The cover of this book is really nice and the colour is really nice and the picture on the front cover is really nicely done l like the font of the writing. I am happy l read this book. l would love to rate this book more than five stars but five stars are the highest rating. It did not take me long to read this book. I was hooked on this storyline after reading this book it will want you wanting more. This book was hard to put down once l started reading it. Otto was crowned king after his father passed away but his mother did not like it she wanted Henry to be king who was named after his father. Edith brother was left in charge of his sisters he would have to find his sisters husbands. It was sad to read that Thankmar was stabbed and sadly passed away. Everybody was blaming Otto for Thankmar's death. Otto was heartbroken by Thankmar death. It was sad to read that Edhilda Edith's sister passed away and Otto give Hugh of the franks his sister Hedwig to marry. Edith told Hedwig that both Hugh's wives did not have any children and if she did not have a child with him to lie with another man. Hedwig had a little daughter. Otto wanted to send their son away to get married. Otto's mother did not like that Otto was king. I was sad to read that Edith passed away at age 36 years old. Otto remember his wife with a feast until his death. Otto's brother Henry tried to kill him but it does not work. Otto and Henry makes peace. Otto's mother become a nun. this story is so good. I want to read more of this story now this book left me wanting to read more. The picture on the front cover is Otto, Edith and their two children.